Since the weather hasn’t been very good for astrophotography the last 1,5 months I have been working on older data to see what I can get out of it. 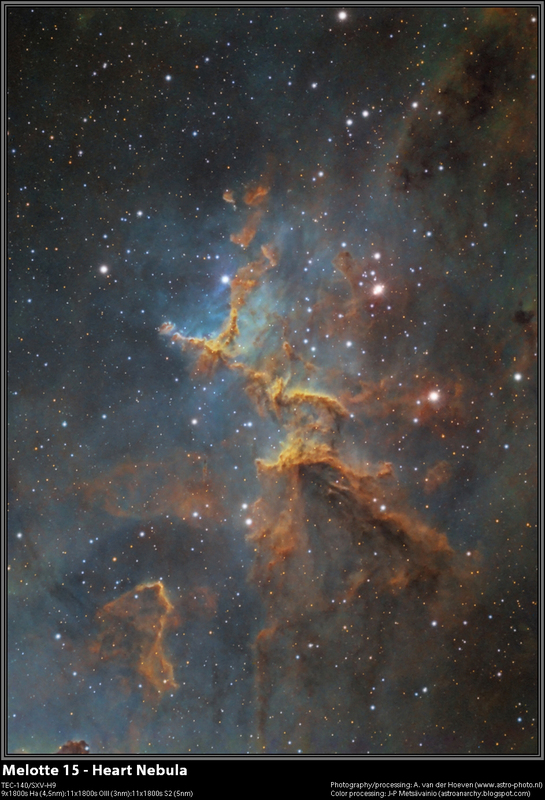 In October/November 2012 I imaged Melotte 15 in the Heart nebula, which is one of my favorite objects. “The bright star cluster [known as an “open cluster”] is known as Melotte15 after its discover, Philibert Jacques Melotte (1880-1961). Melotte 15 is embedded within and illuminates the central portion of the much larger glowing nebula identified as IC 1805. The three bright stars in an arc at the center of this image are type “O” stars which are the brightest and most massive stars known. Type O stars are also the shortest lived. While the Sun, a type “G” star, will happily burn its hydrogen fuel for 10 billion years or more, type O stars burn through their much more massive amount of fuel [typically type O stars are 20 to 100 times more massive than our sun] in as short as 3 to 6 million years. A very short lifespan as far as stars go. Type O stars then end their lives in a spectacular Type II supernova which spreads the elements generated in the core of the star throughout the stellar neighborhood. In fact, the elements that make up our own bodies were created in much earlier supernovas. The interesting structure in the center of the image is a giant area of hydrogen gas that is caused to glow by the intense ultraviolet radiation from the massive stars of the Melotte 15 star cluster. It is estimated that this illuminated gas is more than 50 light years from the Melotte15 stars. When browsing through the internet I found a great set of images made by J-P Metsävainio in Finland. He is well known for his tone mapping processing technique which gives great results in narrowband imagery. I got in touch with J-P and we decided to exchange some data from the Melotte 15 cluster and process each others data. He processed my data using the tone mapping technique and this data was combined with my luminance data to give the result shown in this post. I think this is a nice improvement compared to my earlier version.